When believers need a verse to lift them up or seek a biblical answer to a question, "Promises from God's Word[registered]" can help them find it. It lists every promise to believers that is recorded in Scripture, providing the assurance of God's faithfulness when readers are looking for strength and comfort. 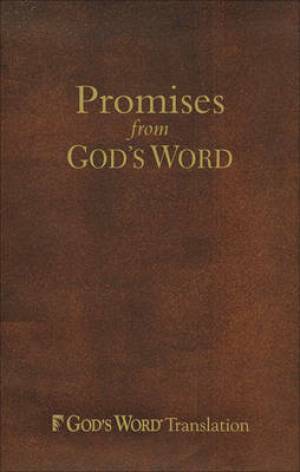 This affordable, pocket-sized book of promises features clear, understandable verses from "God's Word[registered] Translation". It is a treasure trove of guidance for daily challenges and covers topics such as peace, direction, wisdom, healing, perspective, prayer, faith, courage, and forgiveness. This collection of more than 2,000 promises from Scripture is organized by topic for easy reference. Promises from God's Word by Baker Publishing Group was published by Baker in January 2010 and is our 22758th best seller. The ISBN for Promises from God's Word is 9780801013386. Be the first to review Promises from God's Word! Got a question? No problem! Just click here to ask us about Promises from God's Word.